HRC-I BKGRND EVENTS files for 1999-12-06 until the present. HRC-I background PI spectrum files for 1999-10-04 until the present. For the CIAO 4.2/CalDB 4.3.0 release notes, and "How CalDB 4.3.0 Affects Your Analysis," see this link. Time-dependent gain corrections, updated for the period Feb through Apr 2010, have been released as ACIS T_GAIN Epoch 41. The updates are nominal, with no striking new trends. The data affected by this upgrade are any taken since 2009-08-01T00:00:00 to varying degrees based on the interpolation time; however all changes are within 1% of the energy value, versus the previously applied temporary corrections. Note also that data taken since 2010-02-01T00:00:00 (UTC) will still have a temporary T_GAIN correction applied (the version N0002 files above) when reprocessed, until the Epoch 42 data become available. See the Technical Details section for more information about Epoch 41 corrections. The new file above completes the set (so far) of time-dependent GMAPs (gain correction files) for HRC-I up through 2009 and part of 2010. New files are expected to be added approximately annually in teh future, depending on the behavior of the instrument gain. For more information on the HRC-I time-dependent gain correction, consult the Chandra Calibration memorandum SUMAMPS-based Gain Maps for the HRC-I. The ACIS T_GAIN Epoch 41 completed on 30 Apr 2010, and new T_GAIN corrections have been derived. As with each T_GAIN upgrade, the previous epoch's interpolation files are finalized with the following epoch, while the newly completed epoch's files are generated in a "flat," non-interpolating form in anticipation of the current epoch's completion in the future. The effects of the latest upgrade files, relative to the previous sets, are illustrated in Figs. 1-3 below. Fig. 1 gives the corrections in eV for the aimpoint of ACIS-I3, CTI corrected. Fig. 2 gives the same for ACIS-S3 with the BI chip CTI-corrector applied. Fig. 3 gives the same data for ACIS-S3 with no CTI correction. This latter is relevant to GRADED MODE datasets for ACIS-S3. Fig. 1: Comparison of the total change in eV due to the Epoch 39, 40, and 41 T_GAIN files, for the I3 aimpoint. Fig. 2: Comparison of the total change in eV due to the Epoch 39, 40, and 41 T_GAIN files, for the S3 aimpoint, CTI correction applied. Fig. 3: Comparison of the total change in eV due to the Epoch 39, 40, and 41 T_GAIN files, for the S3 aimpoint, with no CTI correction. HRC gain map files (GMAPs) are images that hold the relative gain corrections to be applied to the pixels of the HRC-I and HRC-S plates. For HRC-I the GMAPs are individual files that are displaced in time, and give a discreet temporal variation at approximately yearly intervals. This latest file to be added is effective from 2009-09-24T12:00:00 until the present, and all HRC-I observations taken since that date are affected by this upgrade. Reprocessing of HRC-I observations with the new GMAP may be done in CIAO 4.2 or later, with CalDB 4.3.0 or later version installed, using hrc_process_events. 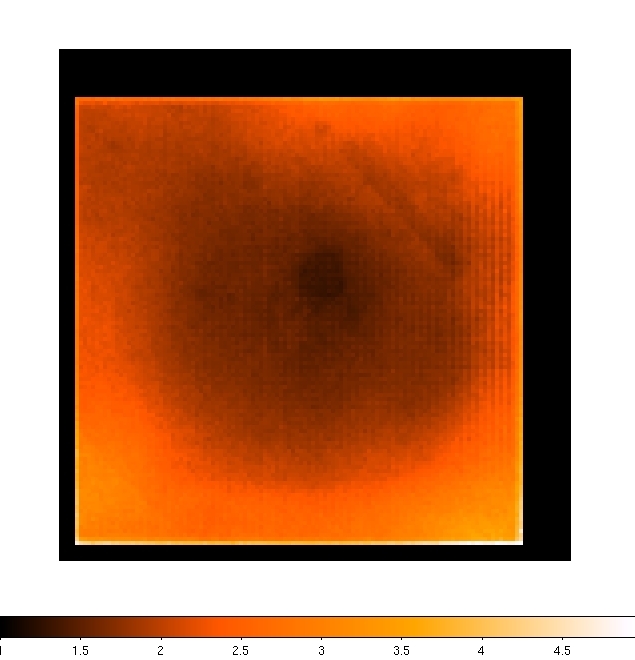 The image of the GMAP on a linear color scale is given in Fig. 4 below. Fig. 4: An image of the Sep 24, 2009 SAMP-based GMAP introduced with the 3.4.0 CalDB release. The HRC-I stowed background events files were compiled from datasets of HRC-I events taken with the detector in its stowed position, with the telemetry running, where the particle background (cosmic rays) could be measured as it varied over time. The timescales of interest have been taken to be annual periods, so that each file displaced in time by one year gives the anticipated results for observations taken during that calendar year. The stowed background study, conducted by T. Isobe (SDS) and M. Juda (HRC), is reported in High Resolution Camera Stowed Background Study. Although the isotropic flux of high-energy particles might suggest the background should be spatially uniform, shielding by spacecraft and detector structures can be expected to produce some variations in the spatial distribution. The maps were created to study these variations. These new CalDB files are best used with the new CIAO thread The HRC-I Background Event Files. For the CalDB, these files have had their TIME columns and GTI extensions removed so that they would work properly with the CIAO tool reproject_events. The background PI spectra are created from HRC-I calibration observations of AR Lac taken yearly at 21 locations on the detector. For each year, level 2 event lists are created by reprocessing the data with the latest CIAO/CALDB version. Time-dependent gain corrections are applied to the scaled SUMAMPS values to create PI. For each year, we extract events in a 800x800 pixel box at the 17 observation locations less than 10 arcminutes from the aimpoint, excluding the location where the source is located. We sum the PI spectra from each location, weighing by exposure time, to create the final PI spectrum for the year. Finally, the PI spectra are Loess-smoothed with a third degree polynomial fit over ranges 10 channels wide. The following figure shows the PI spectra for each year. Fig. 5: The PI spectra from each of the ten PIBGSPEC files in CalDB 3.4.0.